Dr. Julia Visor was Assistant Professor of English and the Coordinator of the University Center for Learning Assistance at Illinois State University. Julia touched the lives of many people in her roles as teacher, administrator, certified supplemental instruction trainer, author, presenter and mentor. Julia was a long-time member of NCLCA who is missed deeply. Dr. Julia Visor lost her battle with cancer in January of 2002. It was definitely one of the few battles Dr. Visor ever lost. Dr. Visor was a firm proponent of opportunity for all: Julia saw herself as an educator who encouraged students to be proactive agents and strong advocates of their own learning. 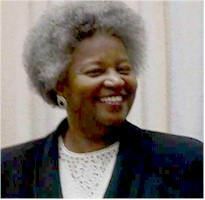 She was a very strong force in many lives as well as an advocate for diversity. She was a beacon for learning and striving to achieve. In addition, her joyous smile and caring will be deeply missed by all who knew her. Julia Visor received her Bachelor’s degree in English from Illinois State University in 1971, her Master’s degree from Ohio University in 1975, and her Doctor of Arts degree from Illinois State University in 1987. She joined the English department faculty that year, and in 1997 she became the Coordinator of the University Center for Learning Assistance. She taught courses in composition and rhetoric and in African American literature, and she served as a mentor and advisor for many graduate students working in those areas. In 1996 she was recognized with the David A. Strand Award for Diversity Achievement. All full-time or part-time graduate students who present at the NCLCA annual conferences are eligible for this award. No application is necessary other than submitting the annual conference proposal, indicating graduate student status on the cover sheet of the proposal, and registering as a graduate student at the conference. Two $500 awards are available. The award is intended to encourage graduate student participation by helping to cover travel related expenses. In the event that there are less than two exclusively graduate student proposals, additional awards will be given to students at the discretion of the professional development chair and NCLCA board.